Below you’ll find a brief background for each of the experts who will be part of your Chivalry Today event. 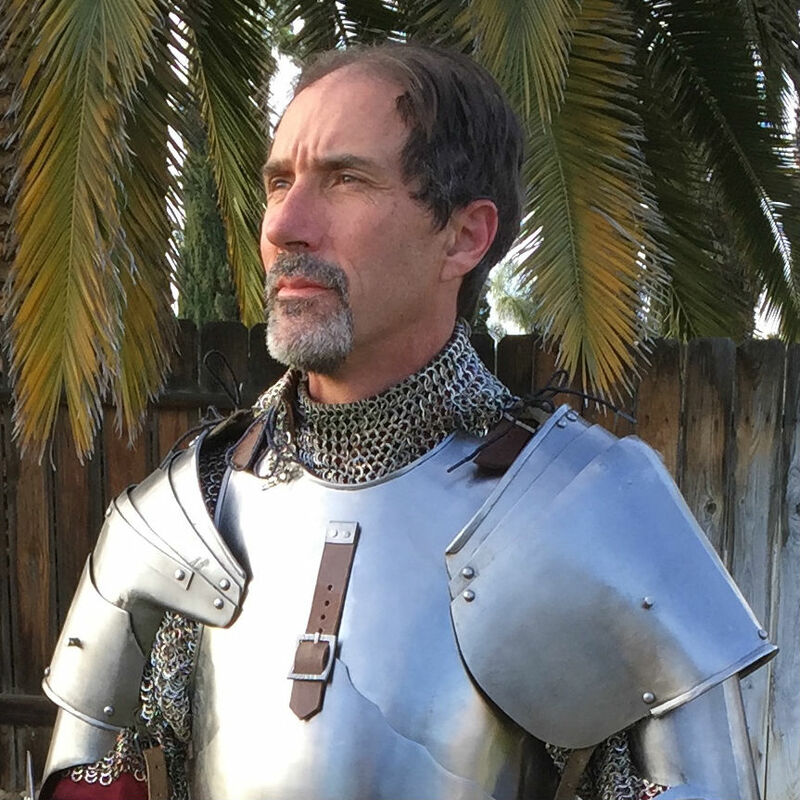 Scott is the founder and director of Chivalry Today, and he has more than 30 years of experience in the fields of arms, armor, and medieval military history. He has been involved with independent study programs at the Royal Armories at Leeds, and with Cadw (the department of the Welsh government in charge of preserving castles and other historical monuments). 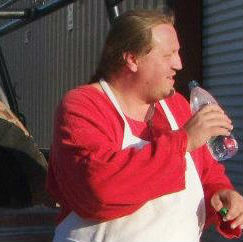 With a college degree in English literature, Scott is also an avid reader and student of folklore and Arthurian legend. In addition, Scott studied theatrical performance at San Diego’s Old Globe Theatre, and periodically works as one of the teaching artists (school performers) with San Diego’s Intrepid Shakespeare Company. He has worked with the San Diego City and County Library Systems as part of the annual Summer Reading Program since 2006. Scott is a professional journalist and author, and his articles on medieval history and the ideals of chivalry have appeared in many print and on-line publications, including Renaissance Magazine, Military History Quarterly, Civil War Times, Chivalry Sports, Tournaments Illuminated, Men Today, and Police Magazine. His chapter “Sir Aristotle and the Code of Chivalry” is included in the book Martial Arts And Philosophy (Open Court Books, 2010). You may also recognize his voice as the host of the Chivalry Today podcast, and the ringside “color commentator” from San Diego’s acclaimed Tournament Of The Phoenix competitive jousting event, held each October at the Poway Rodeo Grounds. Scott has given lectures and demonstrations for a wide variety of groups with an interest in medieval history, armor, castles, knighthood, and the code of chivalry, including: The San Diego Shakespeare Society, The San Diego Historical Society, University of California Irvine Faculty Club, San Diego State University, Kiwanis International, The Rotary Club, The Boy Scouts of America, Sisters In Crime Mystery Writers, and Romance Writers of America. For more information on Scott's written work, please visit his website. Kyle Lazzarevich has studied the art of historical combat and fencing for more than 10 years, and has assisted in presentations in armored combat techniques for a variety of conferences and educational centers, including the 2013 and 2014 SoCal Swordfight HEMA Conferences, the SCA’s Great Western War Historical Reenactment Convention, and the “Chivalry Family Day” at the J. Paul Getty Center. Kyle is one of the presentation team in Chivalry Today’s “Deed Of Arms” historical armored sword combat educational demonstration, and is one of the head coaches with the Swords Of Chivalry HEMA program, and Chivalry Today’s “Warrior Camp” summer camp program. 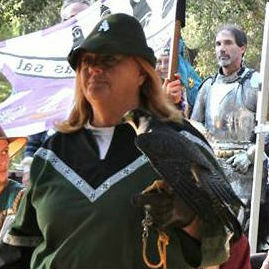 Terry Lockwood is a federally licensed falconer and expert in birds of prey. She works with several habitat conservation and raptor rescue organizations, including the Ramona, California-based Skyhunters. Terry is Chivalry Today’s official “falconer to the duke,” and presents talks on falconry and medieval hunting traditions as part of Chivalry Today’s Festival of Chivalry school history faire days. 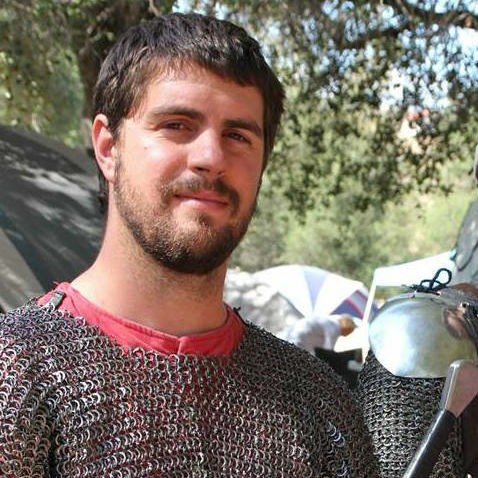 Mike Mason is an amateur history enthusiast who has been taking part in medieval historical reenactment events for more than a decade, and has cooked several historical-themed feasts for 100+ diners. Anyone who has sampled Mike’s cooking will never forget the marvelous taste of bread or pizza from “the bake-inator,” his 600 lb. traveling brick oven, based on designs shown in medieval artwork. Mike presents “Our Daily Bread,” a demonstration of the art of baking in a 14th century wood-fired oven, as part of Chivalry Today’s Festival of Chivalry school history faire days. Danielle Mitchell has a degree in education and has taught at several private and charter middle schools in the San Diego area. 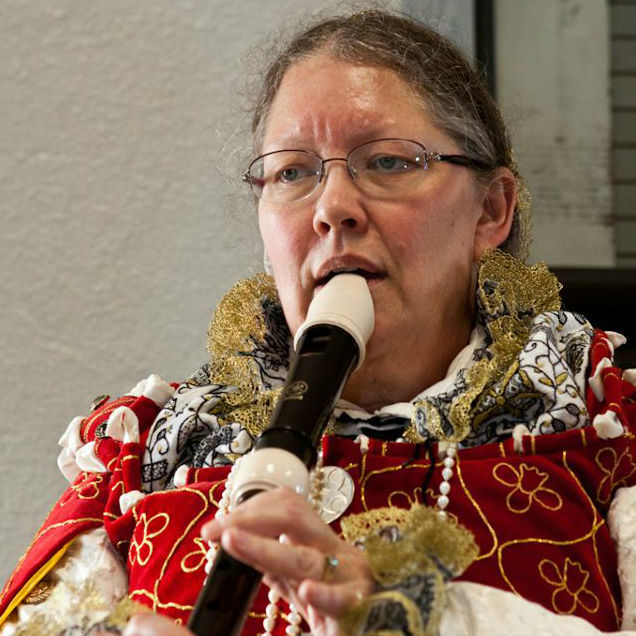 She is an amateur history enthusiast and reenactor, with an interest in medieval and Renaissance dance and music. Danielle plays a variety of 14th c. stringed and woodwind instruments with the Calafian Consort, an informal group of medieval musicians. She presents “Medieval and Renaissance Dance” and “Medieval Song and Music” as part of Chivalry Today’s Festival of Chivalry school history faire days. Deborah Fox is a Doctor of Veterinary Medicine, who is also an amateur medieval history scholar, with skills ranging from Elizabethan fashion, and courtly music, to 11th c. embroidery and medieval calligraphy and drawing. 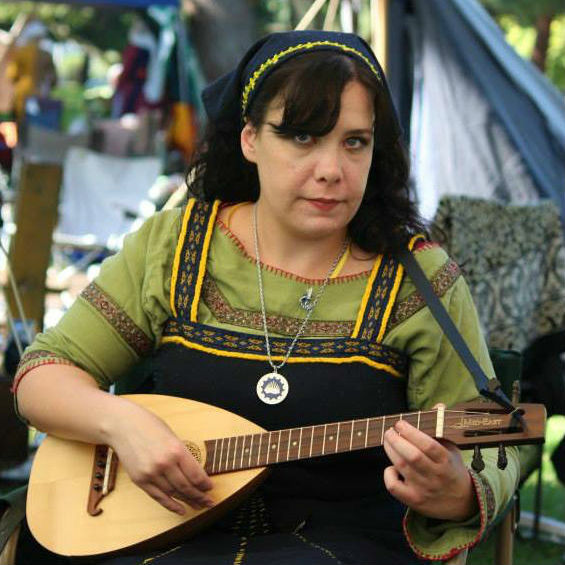 Deborah coordinates a team of early music experts and presents “Knight Music: Courtly Tunes of the 14th Century” as part of Chivalry Today’s Festival of Chivalry school history faire days.